Teaching English at Montana State University, Greg Keeler met Trout Fishing in America author Richard Brautigan in 1978 and opened a wildly memorable chapter in his own life. Having secluded himself on a 40-acre ranch in Paradise Valley, Montana, in the mid-1970s, Brautigan needed a friend with whom to talk and carouse. Attracted like a moth to the flame, Keeler became that friend and confidant, driver and clumsy co-conspirator in a number of escapades on the trout streams and rivers, at bars and cafes, and along the back roads of Montana. Together they waltzed through many late nights, until Brautigan took his own life in Bolinas. California. in 1984. Twenty years after Brautigan's death, Greg Keeler recalls those times with haunting clarity. 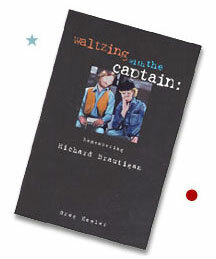 Illustrated with photographs and the author's cartoon-like drawings at the head of every chapter, Waltzing with the Captain is darkly funny and poignant in its revealing portrait of an important contemporary American writer, and in its candid story of an often-tested and bumbling friendship between two poets. Keeler has taught English literature and Creative Writing at Montana State University since 1975. A prolific painter and musician, he’s written several musicals and published seven books of poetry, including American Falls (Confluence Press, 1987), and Epiphany at Goofy’s Gas (Clark City Press, 1991). He’s recorded 14 CDs and tapes of his satiric and flat-out funny collections of songs and poems, including Live from Nowhere (Troutball Productions). Winner of a number of awards for teaching and writing, he was awarded the Governor’s Award for Outstanding Achievement in the Humanities from the Montana Committee for the Humanities in 2001. To learn more about Greg, visit his website: www.troutball.com. $15 (plus $3 Media Mail shipping). Quality paperback original first edition, 168 pages, ISBN # 0-931659-93-0.